This part of the Lake District – Grasmere and its environs – has lately rebranded itself as “Wordsworth Country”. And we are told literacy is dying out! Not while there is culture to be gleaned. So, here we all are: writers for The Wordsworth Trust’s Romanticism Blog, gathered for a weekend to celebrate Wordsworth, his poetry, his life, his associates, his dwelling places and, yes, his blasted weather. I wandered lonely as a cloud? There are no lonely clouds in Rydal: they gather in nebulous hordes, descend from the mountain and cloak us in wet mist and, at times, a solid downpour akin to an aerial Rydal Falls. But precipitation brings lushness, the green and the growth of gardens and landscape that continues to inspire. 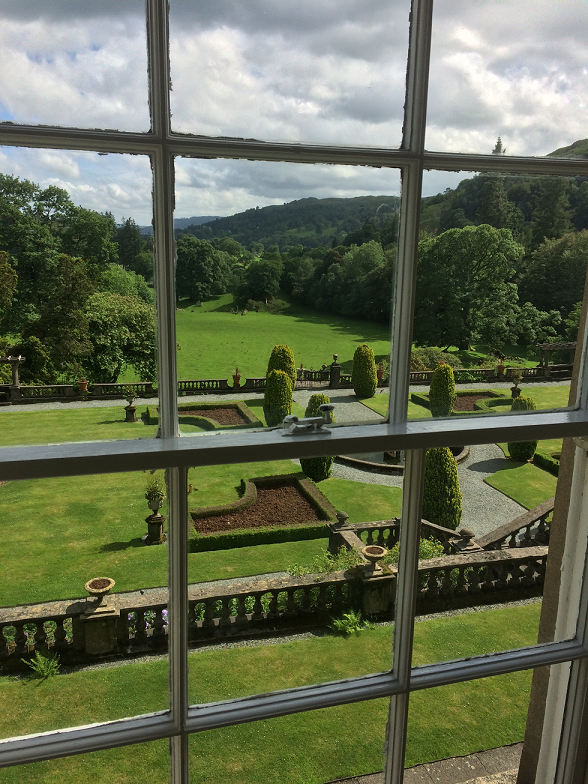 My wife Sarah Doyle has bagged the two of us a fabulous first floor room at Rydal Hall with stunning, stately home level views… as well as a sloping floor, resulting in an inclining bed and sloping writing desk that at first I take for an optical illusion. On our final morning we video a 1p coin rolling un-pushed across the table’s surface as scientific proof. Over the course of the weekend, we are treated to talks by Professor Stephen Gill – undoubtedly the world’s leading authority on Wordsworth and an avuncular and genial orator. There is also a presentation by Giuseppe Albano, the personable curator of Rome’s Keats-Shelley House, drawing the circle somewhat wider to encompass other greats of the Romantic Age. Don’t tell anybody but – even though Composed Upon Westminster Bridge is one of my favourite poems and was somewhat in my thoughts after recent terrible events in my home city – to date I have tended to favour the works of Coleridge, Byron and Shelley ahead of dear William. But that may be about to change. Professor Gill told us that Wordsworth wrote some of Ode: Intimations of Immortality over breakfast so advised us to (re)acquaint ourselves with it before next day’s breakfast; and I duly did. 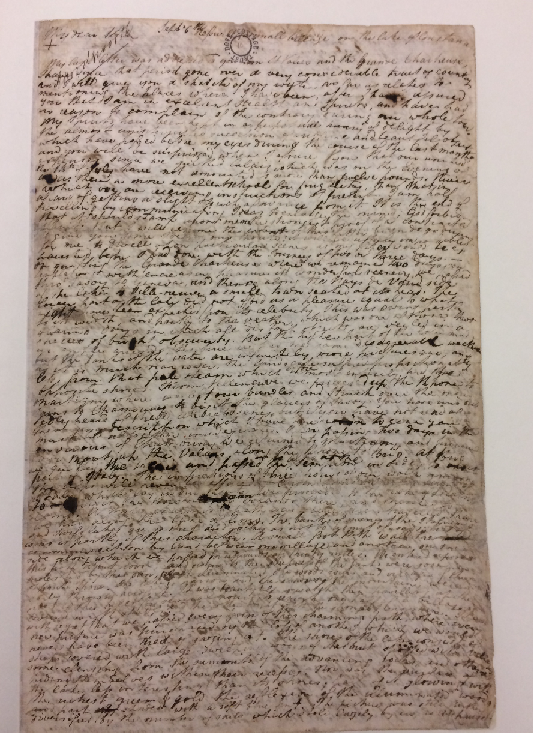 Between visits to Rydal Mount and Dove Cottage, we had the privilege of a session at the Jerwood Centre led by Jeff Cowton where we could study first editions of Lyrical Ballads and original manuscripts and handwritten letters from the early nineteenth century. With paper in short supply, these latter were written in what we would now term a small, “difficult” font. And then turned through ninety degrees to be cross-written with further family news or, touchingly, amorous outpourings between William and wife Mary. I was first in the queue to utilise the quill and alchemically created ink but, try as I might, I could only write large hand in an untidy scrawl that I blame variously upon A Level note-taking and a tendency to edit manuscripts on bumpy buses and tube trains. God bless Laszlo Biro and, latterly, Microsoft Word. This was a lovely weekend in the esteemed company of so many experts and academics, where the literary table talk was only occasionally peppered with observations on the messy outcome of the General Election as well as a touch of football banter. Guilty as charged. And the sun shone brilliantly on the knot garden during Saturday evening…. Now, I wonder what our collective noun might be. Perhaps: a charisma of bloggers? Allen Ashley works as a creative writing tutor with five groups currently running across north London. He is the author or editor of eleven published books, the most recent of which is the poetry collection Dreaming Spheres: Poems of the Solar System written in collaboration with Sarah Doyle and published by PS Publishing (UK) in 2014. www.allenashley.com. If you’d like to become a blogger for us please do get in touch.